The Legion of the Damned are coming! 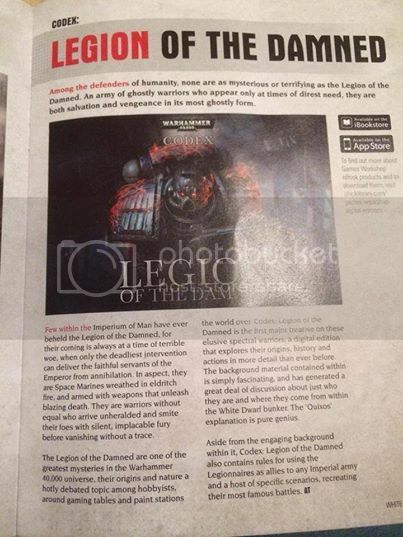 Sighted is an article showing that The Legion of the Damned are getting their own digital Codex! I don't buy many of the digital editions, but this is interesting. The Legion adds a lot of cool fluff to a good game of Apocalypse. Apocalypse40K is a registered trademark of Dice of War, Inc.. ©Copyright 20010-2013. All rights reserved. Conversations about Horus Heresy battles in the year 30,000! Spikey Bitz giving away 60 lbs of Bits! Dreadclaw Drop Pod Returns to Forge World! New Knight Photo and Pricing! Copyright © 2009 Heresy30K - The Horus Heresy Blog.